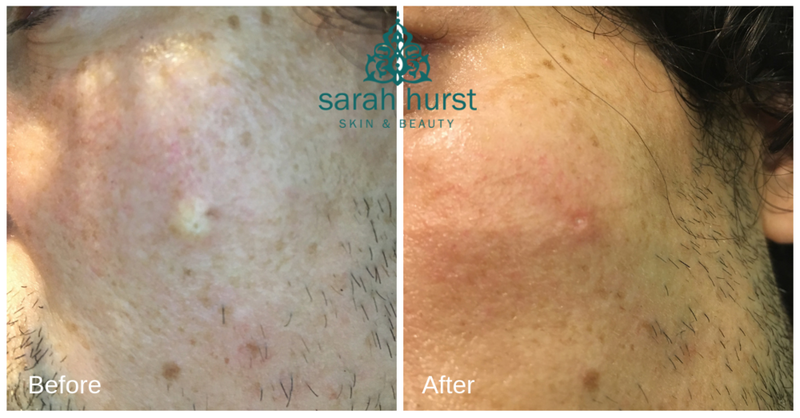 Sarah is an expert in the effective removal of skin disorders and blemishes. 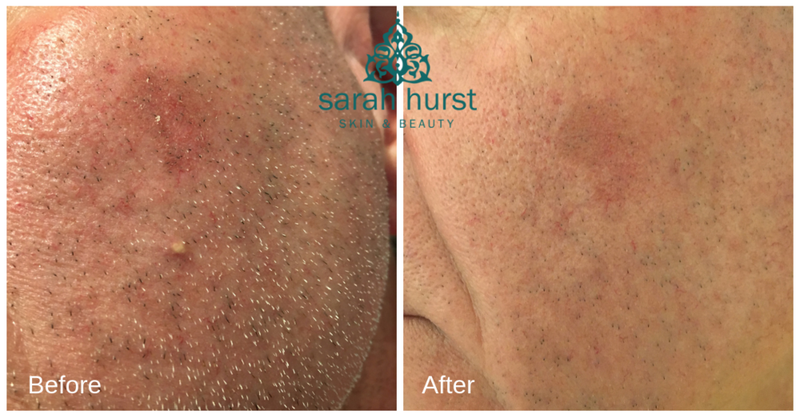 With over 30 years experience in this treatment you can be reassured that you really are being treated by someone who has a wealth of experience in treating these conditions. A wide diversity of skin blemishes can be quickly and easily treated with immediate and effective results offering an eventual blemish free, smooth skin. Milia are tiny white hard lumps containing keratin which lie superficially under the surface of the skin and can easily be treated with ACP techniques. These appear mostly on cheekbones near to the eye and are formed when sebum becomes trapped in a blind duct, with no surface opening. Their exact cause is unknown although they are often associated with dry skin which can be acidic, a diet with high cholesterol content, or using products on the face that are too strong. The following are our own treatments. Please click on the images to enlarge. Benign wart like growths that occur on the surface of the skin. They are more common with increasing age. They are easily mistaken for moles. Their superficial stuck on appearance is helpful for diagnosis. Their cause is unknown, though they tend to appear quite often on skin that is sun damaged. Ageing, hormonal changes, damage from weather and other temperature extremes, smoking, rubbing of glasses on the bridge of nose, hereditary disposition, pregnancy and skin fragility. 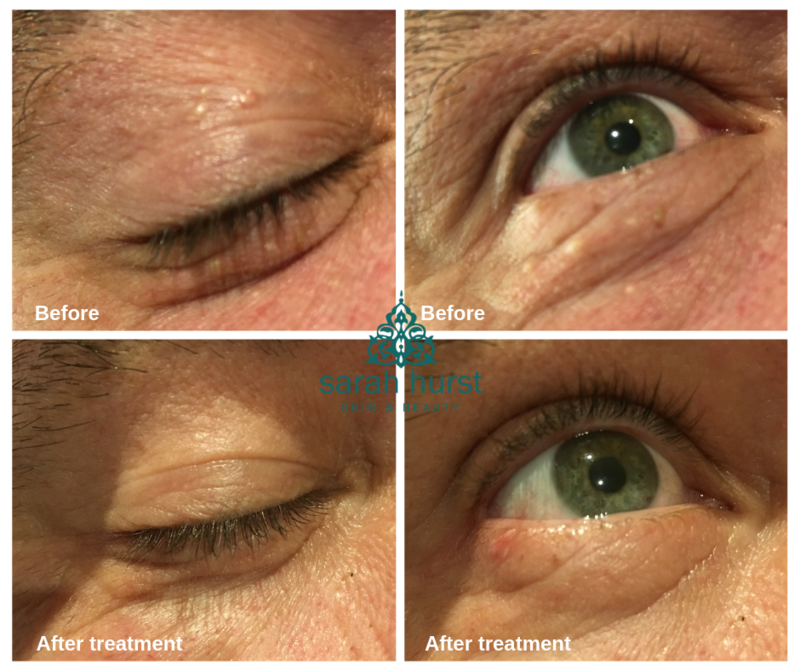 The following images are our own treatments. Please click on the images to enlarge. From the wart family, these are flat warts (clinical name: Plantar wart) usually found on the soles of the feet. Warts are benign lumps that can appear anywhere on the body, but often on the hands and feet. They are rough lumps that are caused by the HPV (Human Papilloma Virus). This causes a hard protein to develop in the epidermis, which produces a rough, hard textured area that is a wart. Warts can vary in appearance depending on what part of the body it is on. Sebaceous Cysts more commonly occur on areas of the body which are more oily and therefore have more sebaceous glands. They occur by an over production of sebum that becomes blocked by an overgrowth of skin. They can vary considerably in size, ranging from a pea to a small egg! Sebaceous Hyperplasia is a common condition that is benign. Can occur at any age but is more common in adults of middle age and older. Lesions tend to be more common on oily areas of the skin such as on the face and be in crops. they are small, round, yellowish papules. A viral infection of the skin. Most commonly found in children, the area affected has small, dome shaped flesh coloured or pink spots with a central punctum. A form of pigmented naevi that are commonly found on the face and body. Moles vary in size and colour from pale tan to brown to bluish black and often develop deep terminal hairs in them because of a well developed vascular supply. 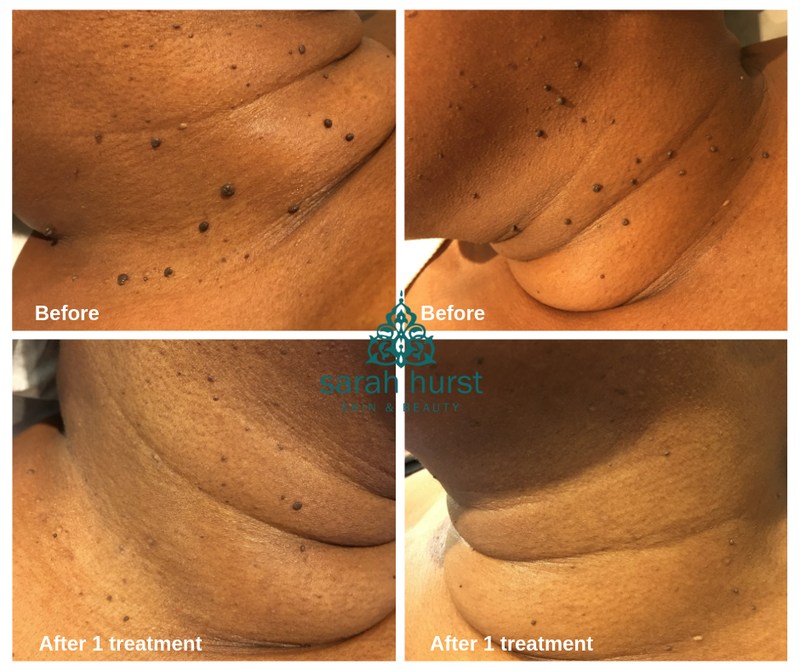 We don’t remove moles, but aim to reduce them in size. Xanthomas are deposits of fatty material under the surface of the skin ranging in size from very small to more than 3 inches in diameter. They may be a symptom of metabolic disorders that are an increase in blood lipids. They may appear anywhere on the body. The cause is unknown but typically associated with an elevated cholesterol level. Hairs commonly grow from moles as there is an increased blood supply to them. Benign not contagious flesh coloured elevations of the skin. The most common locations for syringomas include upper cheeks, lower eyelids, armpits, chest, abdomen, forehead and genitalia. Syringomas typically appear as small (1-3mm) flesh coloured to yellowish bumps. They usually occur in clusters on both sides of the body and in an even evenly distributed (symmetrical) fashion. Syringomas do not itch or cause pain. Flatish papules or plates found around the eye socket area in particular under the eye. The following image is our own treatment. Please click on the image to enlarge. This is a complex, genetic condition caused by an alteration in a gene. People with TSC have growths, sometimes called tubers or lesions in different organs of the body and may have epilepsy, learning disabilities, autism spectrum disorder and kidney problems. Severity of symptoms can vary greatly. Some form of dermatological sign will be present in 96% of individuals with TSC. Most cause no problems but are helpful in diagnosis. Some cases may cause disfigurement, necessitating treatment. The most common skin abnormalities include a rash of reddish spots or bumps consisting of blood vessels and fibrous tissue in a butterfly distribution on the nose and cheeks. The procedure varies depending on the skin condition being treated. The procedures are carried out using a fine needle to facilitate current in the area being treated. You treatment procedure will be explained in full at time of consultation. The treated blemish will not return, once treated in full, but others may occur depending on the root cause. We will advise you during the consultation. Advanced Cosmetic Procedures are safe and effective and offer instantaneous results in many cases. Length of treatment very much depends on the problem. Your therapist will advise you of this although it is difficult to state a definitive time. The area must not be overworked and your skin reactivity will be taken into account. Spacing technique and treatment intervals will be carefully considered in a treatment plan by the professional as well as taking into account your requirements, needs and wishes. This is dependent on how large an area is treated, and how well the skin heals. 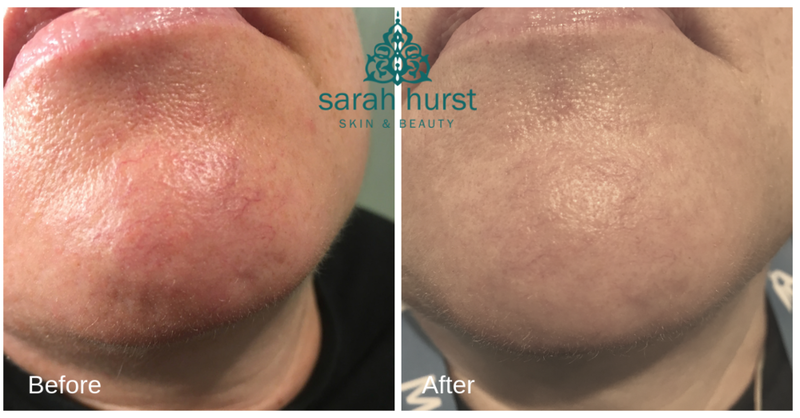 Regular appointments are required dependent on skin healing, usually 3 weekly if skin heals well, although it is recommended that you always leave 4 weeks between the first 2 treatments as although on the surface healing appears complete, healing is still taking place in the lower levels of the skin. In the case of broken capillaries, how long will it take before there are no visible capillaries? This is very much a personal opinion. The benefits hugely out way any discomfort felt. A feeling like pin pricks will be experienced. Pain thresholds may be lowered at certain times in the menstrual cycle, if you are unwell, or when stress levels are high. Again, this is dependent on the condition being treated, but often the skin will look red, possibly swollen a little and warm. The area must not be touched and pin-dot crusts, or larger scabbing may appear, that should not be picked off but left to fall off in their own time – anything from 2 days to 2 weeks. You may also experience an ‘itchy’ feeling which may be the body’s pain receptors responding to chemical substances such as histamine that accumulate in response to local trauma.